I’m working my way through Neil Gaimon’s bibliography and American Gods is my favorite so far. It hooked me from the very first paragraph and I had to force myself to put it down at night or I wouldn’t get any sleep. Growing up I was fascinated by mythology and read everything I could get my hands on about gods, goddesses, fairy tales, and all the various pantheons. I used to talk to Artemis as if she was my big sister after reading about my name (Cynthia). While she didn’t make the cut as an American God, it was fascinating to see how Neil Gaiman worked the old world gods into the American mythology, and the conflict with the new gods that we as a nation created. I liked Shadow, the protagonist, from the get go and found myself deeply invested in his story. It was very well written, wonderfully paced, complex and satisfactorily concluded. Some of the scenes keep coming back to me like intensely colored playlets as I fall into sleep. I understand it is going to be made into an HBO series; that will hopefully be as awesome as the novel is. 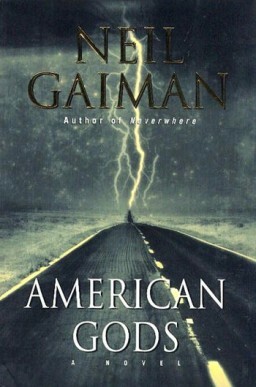 This entry was posted in 2011 Reading List, Fantasy and tagged American Gods, Fantasy, Neil Gaiman. Bookmark the permalink. this is such a good book! When I’m in a reading funk, this is one of the titles I go back to time and time again to get me re-energized. I’m also really excited that HBO picked it up! HBO certainly gets the good ones; I hope they do the story justice. Thanks for stopping by!